Representatives from nearly 200 nations gathered in Katowice, Poland on Sunday for year-end climate talks designed to create a rulebook for implementing the Paris Climate Agreement. To date, just seven nations, most of them tiny, are on track to reduce emissions to meet the 2 degree Celsius goal, while the U.S. is on track to withdraw from the accord by 2020. 3 December 2018 | Alarming signals – arising from the Earth and from scientists – have prompted urgent calls for a decisive international response to climate change as leaders from nearly 200 nations gathered in Katowice, Poland yesterday, Sunday, 2 December, for the start of the 24th annual United Nations climate summit. 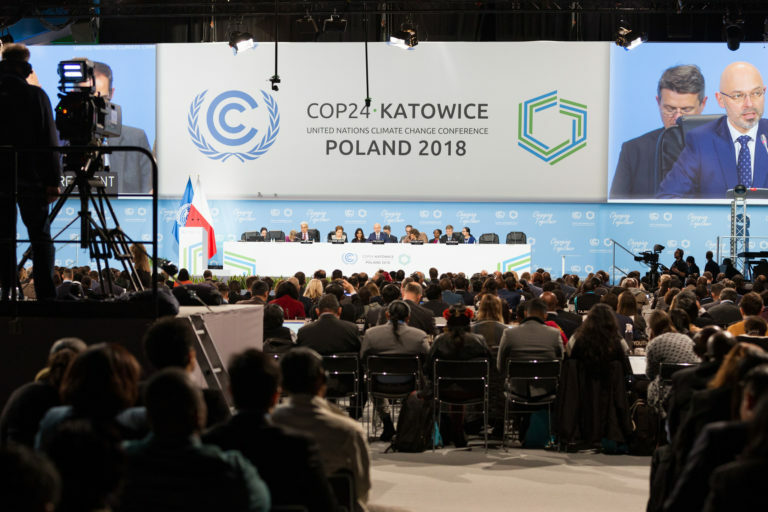 This Conference of the Parties, known as COP24, is the third such meeting since the Obama administration, with China as a vital partner, helped engineer the historic Paris Agreement of December 2015. That accord marked the first time ever in which the world’s 196 nations achieved consensus on the need to reduce their carbon emissions with a goal of keeping global temperature rise under 2 degrees Celsius (3.6 degrees Fahrenheit) by 2100. Unfortunately, since Paris, the physical and political weather has worsened, with global heat, drought and storm surging; and with nations falling drastically short of Paris commitments (just 7 are on target to meet the 2 degree C goal). Since Paris, President Donald Trump has promised to withdraw the U.S. from the accord. And last month, in a sign of more disunity, president-elect Jair Bolsonaro canceled Brazil’s offer to host COP25; in the past, he’s threatened to pull his nation out of Paris. COP24 opening day plenary in Katowice, Poland. Image courtesy of UNFCCC. The two UN summits after Paris were largely dark affairs, mostly devoid of urgency or action. This 24th is being called the most important since Paris. COP24 has three chief goals: complete the rulebook for full implementation of the Paris Agreement; encourage nations to increase their voluntary carbon-reduction pledges by 2020; and gain climate-finance commitments from rich nations to support poor nations most vulnerable to already unfolding climate impacts. If these daunting goals are to be met in Poland, the inspiration and impetus isn’t likely to come from national leaders, say analysts, but from subnationals: cities, states, regions, businesses, faith organizations, indigenous groups, and NGOs that have come together since Paris in broad coalitions that transcend national borders. Even as national leadership has lagged, this is where real climate action is now taking place. Examples of decisive steps taken by subnationals are numerous: under the emerging Alliances for Climate Action, 300 Japanese companies, eager to reduce emissions, have joined the Japan Climate Initiative. Mexico’s climate alliance boasts 35 participating cities, companies and universities. Argentina’s subnational effort includes 2,000 farms that are shifting to precision agriculture, aimed at keeping carbon in the ground. In the United States, the We Are Still In coalition is made up of 3,000 cities, states, universities and corporations representing half of the U.S. economy. The group will have a presence and a pavilion in Katowice, and it aims to enable America to achieve its Paris Agreement carbon-reduction promises, without help from Washington. 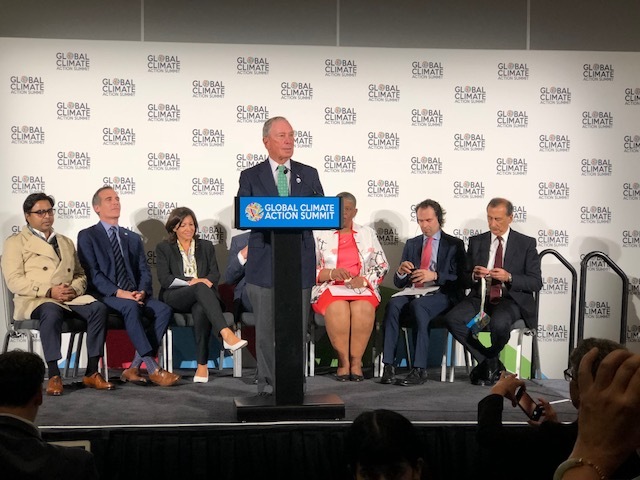 Former New York City Mayor Michael Bloomberg, a co-founder of the We Are Still In coalition, together with California Governor Jerry Brown, speaks at the Global Climate Action Summit in San Francisco in September 2018. Image by Justin Catanoso/Mongabay. The subnationals seem to understand something that nations haven’t mustered the political will to face: that unchecked climate change poses a real existential threat: coastal cities could be destroyed by record storms, farmers stand to lose their crops and livelihoods to deepening drought, while corporations recognize that global warming poses a threat to commodities, supply chains and bottom lines. The world’s largest cities account for 70 percent of carbon emissions today. But 27 of them, including Berlin, London, Los Angeles, New York, Paris and San Francisco, peaked their emissions as of 2017. However, all this good news, while impressive, can be deceiving, and worse, it can offer a false sense of security. Experts agree that subnational progress is not near enough. Those efforts must be made in conjunction with global-scale actions, as entire nations shift away from fossil fuel economies, massively embracing renewable energy, enforcing tough fuel-economy standards and electric-vehicle rollouts and use, outlawing fossil-fuel expansion, creating carbon taxes and carbon markets, and guarding against environmental destruction, especially new deforestation. Gov. 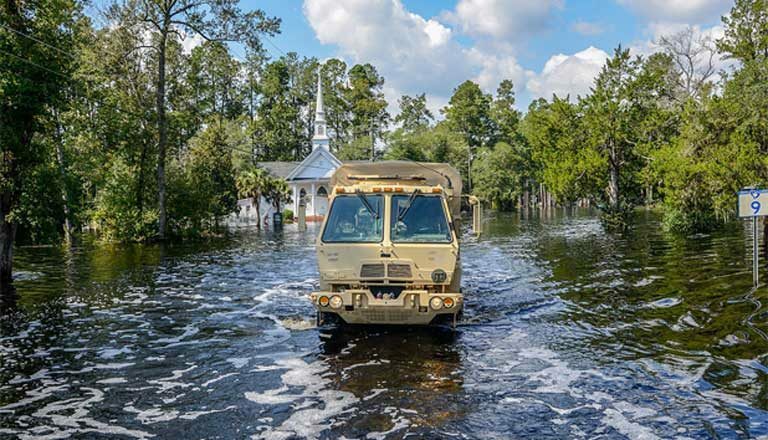 Henry McMaster assesses damages from Hurricane Florence in Nichols, South Carolina, from inside a National Guard high-water vehicle, Sept. 22, 2018. Climate change is intensifying hurricanes around the globe. Image by Staff Sgt. Jorge Intriago/U.S. Army National Guard. In the months before COP24, a steady drumbeat of ominous reports and projections, along with frequent catastrophes, reminded the world just how vital climate action has become. A new United Nations scientific report released in October was the darkest yet produced by the Intergovernmental Panel on Climate Change. The scientists of the IPCC, often criticized for their overly cautious forecasts, predict that the world has just 12 years left in which to cut global carbon emissions by half to prevent catastrophic global warming with its frightening impacts on populations, food supplies, and natural systems. The IPCC called for a globally united, Herculean effort to transform energy production, protect oceans, and implement wise land-use strategies. The IPCC report, its warnings and its recommendations, have no precedent in human history. On the heels of the IPCC document, came a 13 November U.S. report by 13 federal agencies to Congress. Its warnings were also dire, and stressed that predicted climate impacts are coming true now, well ahead of schedule, including rapid sea-level rise, extreme weather and record wildfires. The researchers project that the U.S. economy could shrink by 10 percent by 2100 if dramatic climate mitigation steps are not taken in the near and long term. Other reports pile on: oceans are warming far faster than realized, with coral reefs and aquatic life suffering to a greater degree; deforestation continues to accelerate, most disturbingly in Brazil, guardian of the world’s largest rainforest. Global warming is also coming faster than tropical forests can adapt, thus threatening tropical biodiversity. Despite falling prices for solar and wind energy, some 1,200 coal-fired power plants will be coming on line soon, mostly in Asia – with energy producers and nations heedless of the need to keep carbon in the ground. 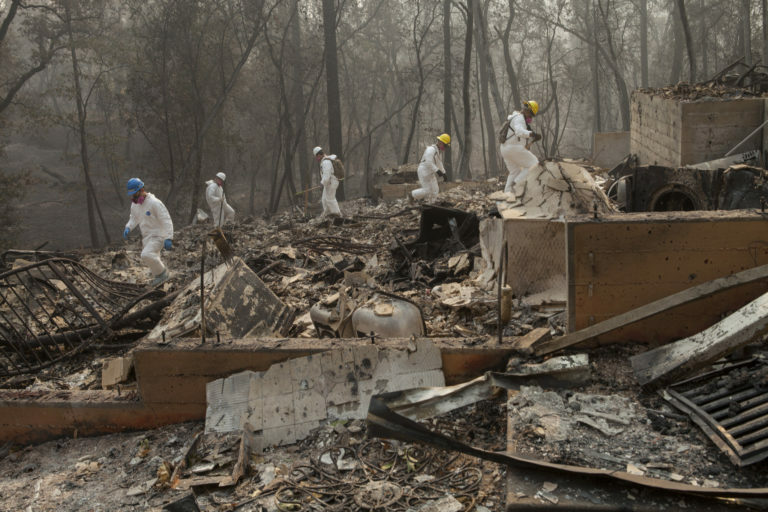 California Army National Guardsmen conduct body search and debris clearing operations, Nov. 17, 2018, after the deadly Camp Fire destroyed the town of Paradise. Wildfires are more numerous and more intense due to climate change. Image by Senior Airman Crystal Housman/U.S. Air National Guard. Meanwhile, 2018 will rank among the four warmest years on record with global emissions expected to exceed 2017’s record output. The world has also endured 406 consecutive months of above average temperatures, a statistical anomaly of epic proportions that should scream for action. But poll the leaders of the world’s largest industrialized nations, and you’ll likely find few that list climate change as an imminent national security threat, or who have prioritized serious action to reduce risk. A question arises: it took 21 climate summits to produce the landmark Paris Agreement. And it is ultimately a toothless accord: a voluntary framework to keep the planet from burning up, not an enforceable treaty backed by international law. So, are continued COPs worth the effort? There are plenty of skeptics who say no, including U.S. environmental activist and author Bill McKibbon, who assert that the COPs produce insufficient results, too slowly, at a time when rapid action is demanded. But others say the often-frustrating UN process retains merits. One area in which COP24 may produce significant results is in discussions about the need to slow deforestation and ramp up reforestation efforts around the world. That’s because preserving and restoring forests is one of the easiest paths to “negative emissions” – pulling CO2 from the atmosphere and sequestering it in leaves, limbs, trunks, roots and soil. Another vital area of action up for discussion at this COP is land use. One-third of the Earth’s surface is reserved for agriculture, with crop fields and pastures contributing as much to carbon emissions – via deforestation for new farmland, tilling, and methane release from cows – as the entire global transportation sector. 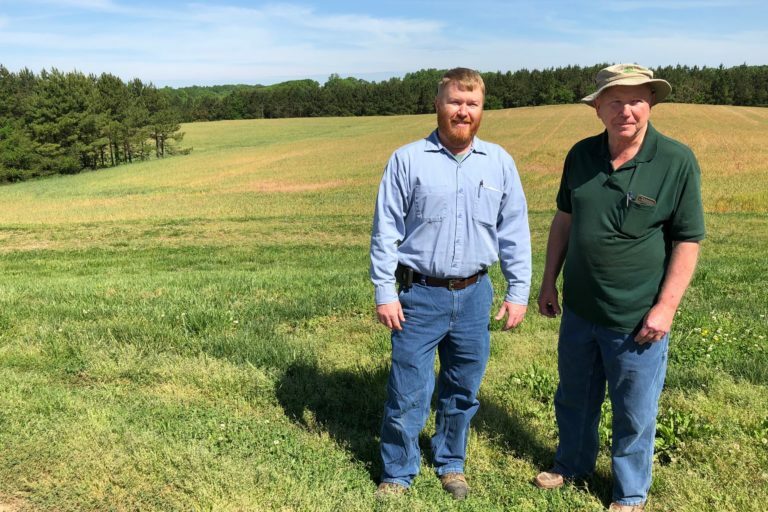 Andrew and Ronnie Burleson, son and father, farm some 4,000 acres in Stanly County, North Carolina. Seen last spring, the field they are standing in has a low cover crop into which Andrew has planted cotton so as to not disturb the soil – a technique that increases yield and better sequesters carbon. Image by Justin Catanoso. Researchers have already demonstrated that improvements in farming techniques can radically increase efficiency – improving yields, on less land, with less fertilizers, and costing less money, while cutting carbon emissions. One example: in central North Carolina, the Burleson family has been farming its 4,000 acres of cotton, soybeans and wheat for three generations. Because their farm is located in rolling hills, erosion is a big challenge. Ronnie Burleson, 68, stopped tilling his fields in the 1960s. Instead, he planted cover crops, then planted cash crops right atop the low grasses. His soil is never fully exposed to the elements, so his carbon emissions remain low. Agriculture extension agents thought he was crazy, he told Mongabay. But his erosion control techniques improved soil health by retaining more carbon and nutrients. That meant less fertilizer. Birds and insects swarm his fields, aiding in pollination, while the cover crops shade the soil, requiring less irrigation. Yields are consistently robust. Andrew Burleson, 40, now works the land, following his father’s proven methods – methods now being promoted around the world on millions of farms large and small. 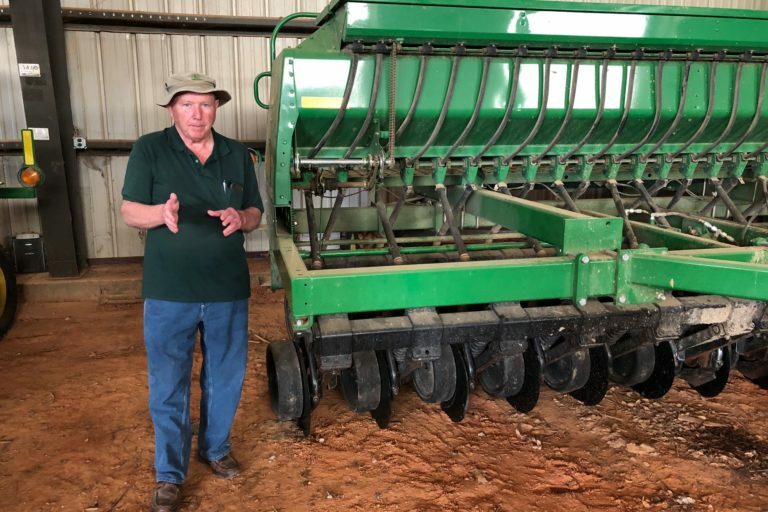 Ronnie Burleson shows off a computer-driven John Deere attachment designed to allow farmers like him and his son avoid tilling, while planting seeds directly into a cover crop. The technique reduces agricultural carbon emissions. Image by Justin Catanoso. Positive economic arguments and climate solutions like these, not doomsday reports, are likely to be the real drivers of positive change at COP24, and into the future, say some experts. On Sunday, as the things got underway in Poland, 50 global corporate leaders issued a letter pledging climate-mitigation cooperation and urging greater governmental urgency. Mahindra chairs one of India’s largest corporations, Mahindra and Mahindra, valued at US$20 billion. With 200,000 employees in 100 companies, he has pledged that all operations will be carbon neutral by 2040. And Mahindra has the resources to make it happen: he now owns India’s largest solar production company. One big challenge comes from obstacles placed by national leaders such as Trump and Bolsonaro, along with fossil fuel producers who continue blocking climate action while denying the potential for a global, renewable-energy driven economic boom. 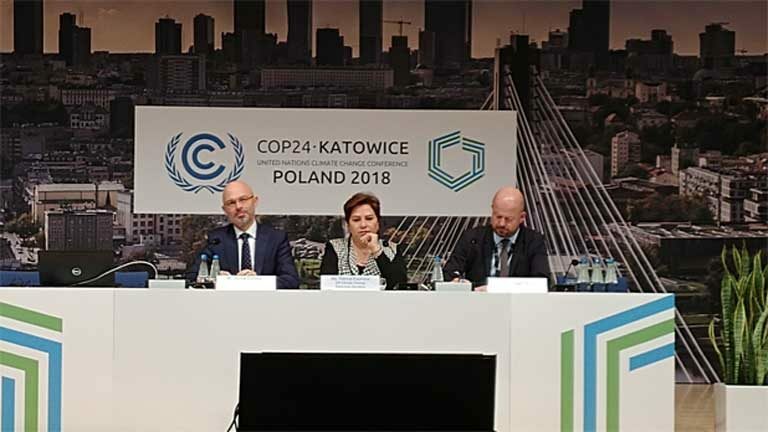 Michał Tadeusz Kurtyka, the president of COP24 (left) and Patricia Espinosa, the executive secretary of the UNFCCC (middle) during a press conference on the first day of the COP24 climate talks in Katowice, Poland. Image by Hans Nicholas Jong/Mongabay. The thousands of delegates, observers, nonstate actors and international negotiators settling in at Katowice are acutely aware of what’s at stake. They understand that the window for aggressive climate action is closing faster than was understood even just a few months ago. But it’s not just the alarming forecasts. It’s the direct evidence: another season of devastating hurricanes on the U.S. East Coast, with deadly wildfires on the West Coast. 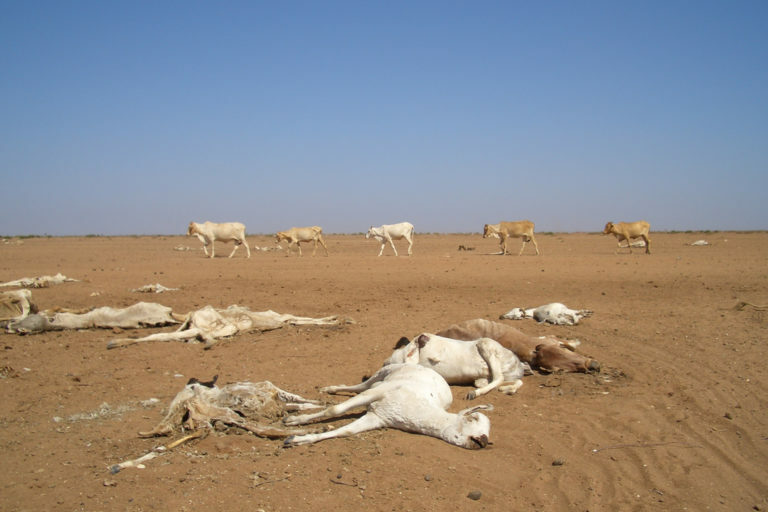 It’s continued drought in Central and East Africa and Syria. It’s unbearable summer temperatures in India and Australia. It’s low-lying island nations, largely unknown to the developed world, and cities like Miami, Florida; Norfolk, Virginia; and Venice, Italy being flooded on sunny days without storms. “Look at it this way,” Steer added. “We are chasing a bus called climate change. We are running faster than ever before in so many ways. That’s impressive. But the bus is running faster.